I remember driving around the Hingham R.F.D. mail route with my father in that old Stanley Steamer . . . . We started up Fearing Road and turned right past the old Cadet Field (now Derby) and then left at the foot of the hill by the harbor and over Otis Street then turned right on Downer Avenue passing the Crow Point Inn and to the Steamboat Landing. Then we took a very sharp left turn and up a very steep hill, Steamboat Lane. 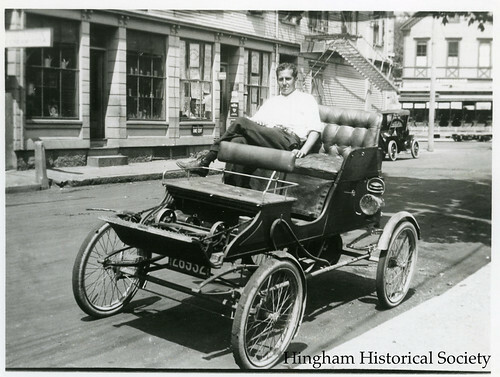 This was before 1915 and there were few automobiles in Hingham then and I doubt if any of them except my father’s Stanley Steamer could go up that hill after a sharp turn. The old Stanley Steamer just went up that hill puffing steam with no trouble at all. The Crow Point Golf Club was at the top of the hill and then we turned right and there was a beautiful view of Boston Harbour. . . . In those days there was an old blacksmith shop as we turned right leaving Downer Avenue on Lincoln Street . . . Mr. Wing’s blacksmith shop and then Jerry Breen’s farm house and barn with a windmill which pumped water from a well for use on his truck garden. There were several of these farms in Hingham and they all drove over Lincoln Street early in the dawn to get to the market district on Hanover and Blackstone streets at Boston by daylight, these huge wagons requiring two horses and sometimes four. . . . 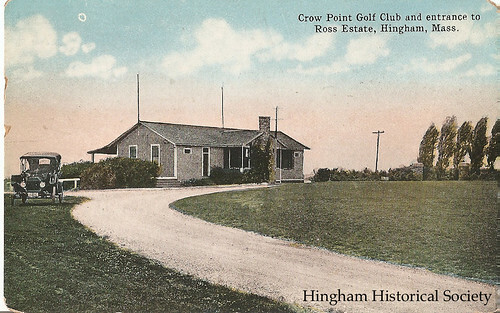 This postcard dates from 1915, around the time young Howard Horton accompanied his father on summertime mail delivery trips up the hill to the Crow Point Golf Club, a 9-hole golf course located at the top of Paige Hill, off Howe Street. Steamboat Hill ran up from the former steamboat landing–where the Hingham Yacht Club now has its pier: the sharp left up the hill remains in place today. The painting above, showing Steamboat Hill from the far side, was made somewhat earlier, in 1895–the year before Melville Garden was closed and development of Crow Point accelerated.